These notes on the Nanocosm project apply to the Nanocosm installation and the Nanocosm grouping of digital prints. The primary presentation of Nanocosm is as a real-time installation showing a miniature world of hexagonal entities that spawn, move, and fuse together to make bigger entities. The miniature world has its own laws and imperatives, a world that goes its own way in indifference to human concerns. Its name, "Nanocosm", is formed on the model of "microcosm". The indifference to human concerns shown by Nanocosm reflects two major currents in our culture. The first is modern science, which has shown us a universe that is indeed indifferent to our concerns and that exceeds the human in every respect; the human is most certainly not the measure of all things. The second current is the development of the computer, whose defining characteristic is its ability to carry out very complex processes autonomously. Although it is a human artefact, it transcends the human in its speed and complexity, and it is transforming human society in a process whose end we cannot foresee. In the past, considerations that transcend the human belonged to the realm of religion; the two cultural currents mentioned represent a secular irruption into our society of powers beyond the human. Nanocosm is a response to this irruption. It is a paradoxical enterprise to try to make a work that points beyond the human while still being an artwork intended for appreciation by humans. I am not alone in this enterprise; perhaps the clearest example is found in the extraordinary geometric patterns used in Islamic art in religious contexts, a remarkable evocation of unity in multiplicity. Unity in multiplicity is an ideal for my own work. A more direct inspiration for Nanocosm is the history of computer-based evolutionary art, which goes back to 1990; see the book Metacreation: Art and Artificial Life by Mitchell Whitelaw, (Cambridge, MA: MIT Press, 2004). Nanocosm also draws on the history of abstract art, and in particular engages with the polarity between geometric and biomorphic forms in abstract art. Nanocosm sits between the geometric and biomorphic poles in its static visual appearance, in its movement and observable behaviour, and in the ideas governing its processes, which are drawn both from biology and from geometric or mechanical considerations. Although I use various metaphors in the description of Nanocosm below, all of these metaphors are weak. The intent is to make a self-contained and aesthetically consistent world with its own laws, not to represent some aspect of real physics or biology. Nanocosm is structured according to the following principles. The work is realised on a multi-level hexagonal grid. There is only one kind of entity, but it can exist in different sizes. The larger entities form the environment for the smaller ones. The various actions of the entities use the multi-level hexagonal grid as a basic structuring principle. The multi-level hexagonal grid is made up of small hexagonal cells; larger hexagonal regions are formed from these cells in such a way that they touch only at their vertices. Details of the multi-level hexagonal grid are given here. Diagram showing hexagonal regions, seven cells across, touching at their vertices. Each entity occupies a hexagonal region of the size appropriate for it. The smaller entities can sit on top of larger ones. The grid structure means that there is no partial overlap: a small entity is either completely on top of a larger one or misses it entirely. I call the entities "plates". The smallest ones are called "platelets" and the largest "tectonic plates". The world of Nanocosm is not very large, though it is large enough to make it difficult for the world to be shown all at once. The computer can easily overwhelm us with enormous numbers, but I chose to make Nanocosm just a little too large to be surveyable as a whole; the work is about the strangeness of the computer rather than its vastness. At any one time there are at most a few thousand plates present in Nanocosm , an insignificant number compared to the trillions of cells in the human body, for example. 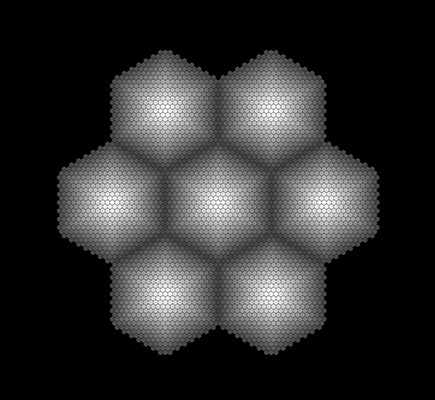 The world of Nanocosm is 1701 hexagonal cells wide, again not a very large number. It is too large to be shown as a whole on current projectors: at a skimpy eight pixels across per hexagonal cell, over 8,000 pixels of width would be needed, compared to the 1920 available in Full HD resolution. A reasonably high-resolution digital print of the whole world would be over three metres square, again just beyond practicality. 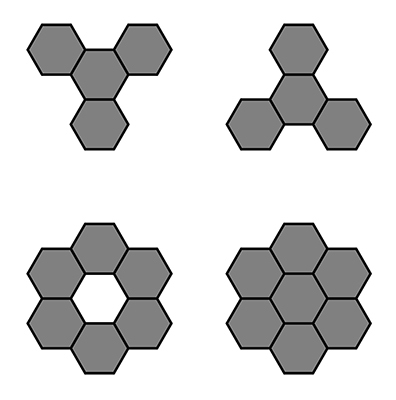 The smallest entities in Nanocosm (the platelets) are seven hexagonal cells across, and each successive size of plate is three times bigger than the previous size, so the widths of the various sizes of plate are respectively 7, 21, 63, 189 and 567 hexagonal cells (the last being the width of the tectonic plates). A further factor of three gives 567 x 3 = 1701, the size of the whole world. In the real-time installation the viewpoint moves randomly across the world. The digital prints for Nanocosm show snapshots of part of the world, with much greater resolution than a projection can. Plates have "DNA", which is similar to the "DNA" in the work Shaping Evolution . The DNA specifies the shape of a plate by means of a distortion process. Two differences from the process used in Shaping Evolution are that six-fold rotational symmetry is built in, and that the plate is required to occupy the six vertices of its hexagonal region, though it may have "holes" in its interior, or even be made of disconnected pieces. 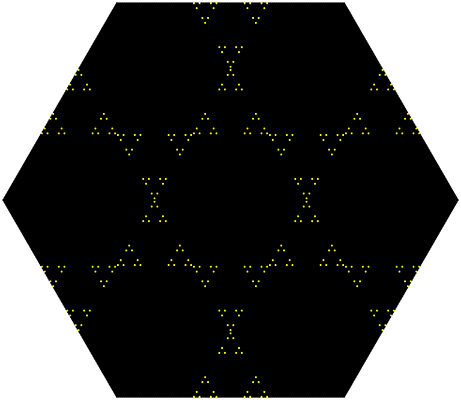 The original undistorted shape (drawn with a considerable number of hexagonal cells). At the start the plates appear in shades of grey only, but they have "latent" colours. The colours are expressed according to the local degree of distortion, which at the start of the evolution is zero everywhere across the plate. In the course of the evolution, mutation of the DNA means that distortion increases above zero and colours become visible. An entity showing the result of the distortion process.The colours that were latent are now expressed. Nanocosm is in part based on ideas of evolution, though the work is less closely tied to biology than Difference Engine or Shaping Evolution . A plate has an "affinity" for its surroundings. This depends partly on how many neighbours it has and partly on the match between the colours of the plate and the colours of whatever larger plate is underneath it; a plate prefers that its own colours have hues slightly further round the colour wheel than those of the colours beneath it. Grey is neutral when it comes to colour matching. Fusion is an entirely mechanical process (inspired by physics rather than biology). When the time comes for fusion, any plates in one of the right configurations for fusion will fuse together to form a single plate of the next larger size. The new plate acquires the DNA of the youngest plate among those fusing, and its form is generated accordingly. Any smaller plates sitting on top of the fusing plates are destroyed. The four configurations for fusion in Nanocosm . Only the smallest plates spawn, which is not what happens in the real biology of insects (for example). The new generation of plates appears at 324 fixed locations (those that, according to the geometry, cannot be above any larger plates). A newly spawned plate has DNA slightly mutated from that of its one parent. The probability of a plate spawning depends on its affinity for its surroundings. Diagram of spawning locations for Nanocosm . I chose to make the smallest plates (platelets) spawn primarily for practical reasons: the larger plates take a long time to form, and the evolution would be very slow indeed if I waited for them to spawn. But having the platelets do the spawning has the interesting consequence that the forms of all the larger plates are epiphenomena from the evolutionary point of view: the evolution only “sees” the platelets. The larger plates exert an indirect influence only, in that the affinity the platelets have for their surroundings affects their probability of spawning. There is a logical problem arising from the structuring principles above and the rules for fusing and so forth; they could lead to the whole system freezing solid. The key is what happens to the tectonic plates (567 hexagonal cells across); if they cannot be destroyed, they can block fusion above themselves, which in turn eventually blocks fusion higher up, and so on. Eventually there is no room for movement or spawning. The solution that I adopted is that if the tectonic plates form the right configuration for fusing, they do fuse, creating a single gigantic plate occupying the whole world. The fusing process destroys every other plate ("Armageddon"). The gigantic plate is unstable and disintegrates, leaving behind a "seed" in the form of DNA to restart the process. The next cycle will not be identical to the previous one, as the starting DNA is different. Time moves in discrete steps in Nanocosm , according to a clockwork-like mechanism (realised in software). The plates of a certain size are divided into groups, according to their positions on an invisible grid; when it is time for one group to move, they all move in lock-step; the same is true for fusion and for spawning. 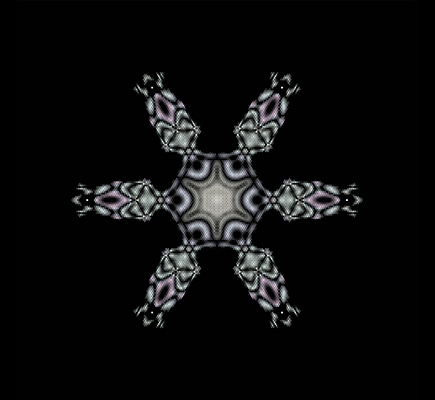 This clockwork division of time is intended to parallel the geometric division of space given by the multi-level hexagonal grid. The time for a cycle to Armageddon is very variable but quite long, several days or more. The ability to evolve over a long time scale is an advantage of real-time work. The choices related to tempo, for the animations for the processes of moving, fusing and so forth, and for the basic actions in the world, really brought out the tension between the ideal of making a world that goes its own way, independently of human concerns, and the reality of making an artwork for humans to experience.